Deathstroke #37 Review – AiPT! Priest’s commentary on Arkham Asylum and Deathstroke give the story depth. Stirring from his slumber, Deathstroke once again finds himself trapped within the padded walls of the infamous Arkham Asylum. With his new best friend, Devon, missing, Virtual Wintergreen out of commission, and the battle with the hostile Pulorians left to the murky depths of distant memory, Slade can feel his grasp on reality beginning to slip. As it becomes more evident that someone has cast him in their personal adaptation of “Caddy Shack,” Deathstroke seeks the aid of the one inmate willing to help: Two-Face. Should Slade trust the duplicitous ex- District Attorney, or should he seek council elsewhere? With Deathstroke #37, readers are allowed to experience an inmate’s life inside Arkham Asylum without the need for a straitjacket. (Even if the contradictions may make your brain scream for one.) Priest brings readers along for this masterclass in gaslighting as he tampers with the information presented in the previous issue to distort your perception of reality. This mental tampering is adeptly executed in part because we are never given a visual payoff to Devon and Slade’s battle with the Pulorians. Without witnessing this battle for ourselves, we are left to question whether it, and by extension Devon, are fact or fiction. As a result, parts of this issue may feel confusing, but I think that’s the entire point. Priest wants the reader to experience Deathstroke’s mental dissonance. Once again, Priest’s commentary about Arkham Asylum and society remain a highlight of the issue for me. Although some of the comments require less homework than the previous issue, it does not change their poignancy. Whether it is the comments regarding Arkham’s need for a revolving door, or Dumfree quoting Ludovici, there is level of depth for each reader to enjoy. What elevates this issue’s commentary is how the story provides payoff for a majority of these statements. Without spoiling the ending, the final moments of the issue help to solidify the comments surrounding the Asylum’s need for a revolving door. Through Priest’s deconstruction of Deathstroke’s reality, readers are given ample opportunity to analyze the character. One of the lingering questions that I had about the previous issue concerned the reasoning behind Two-Face possessing Deathstroke’s mask. With Deathstroke #37, Priest is able to draw connections between the two characters beyond their cosmetic appearances. Wintergreen explains Slade’s duality through describing him as, “The hardened killer who loves his children. The unapologetic villain who nonetheless observes a strict ethical code.” As a result, this duality would naturally make Deathstroke even more intriguing to the character famously obsessed with the number two and an ethical code based strictly on chance. One of Deathstroke #37‘s greatest strengths is also its greatest weakness. Through allowing the readers to experience this gaslighting effect by altering the information we are given in the first issue, Priest runs the risk of making the story confusing. Although I think that this is one of the major positives of the issue, I could see where this would be a turn off for some readers. This confusion is also compounded by the fact that we are not privy to the motivations of some characters. Pasarin’s art with Paz and Parsons inks and Cox and Strachan’s colors does a great job conveying the dialogue and action sequences within the issue. Overall, Deathstroke #37 is a great issue that allows the readers to experience Deathstroke’s gaslighting in Arkham Asylum. Priest’s commentary on Arkham Asylum and Deathstroke give the story depth. Plus, that ending has me already craving the next installment. 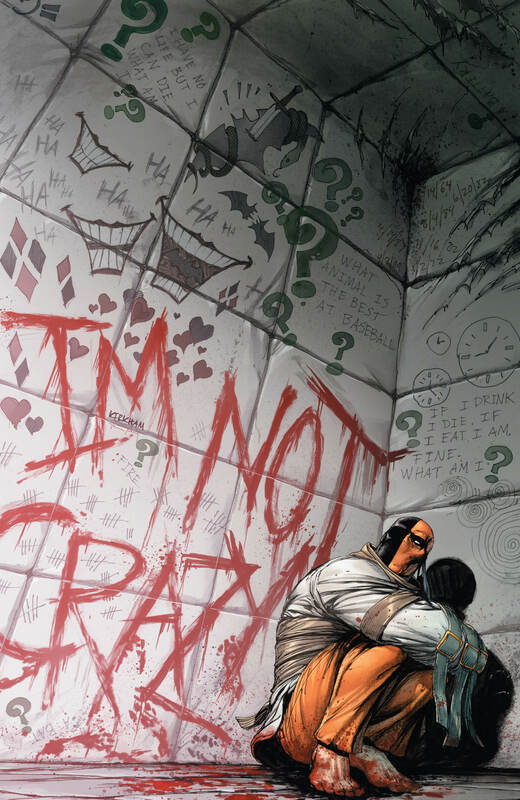 In Deathstroke #37, Priest allows readers to experience an inmate's life inside Arkham Asylum without the need for a straitjacket. For better or worse, some of this may be confusing because of the issue's focus on gaslighting Deathstroke. Priest's commentary on Arkham Asylum remains interesting. Allowing the reader to experience Deathstroke's gaslighting is enhanced by not showing the battle with the Pulorians. The issue may be confusing because much of what was shown in the first issue is negated.